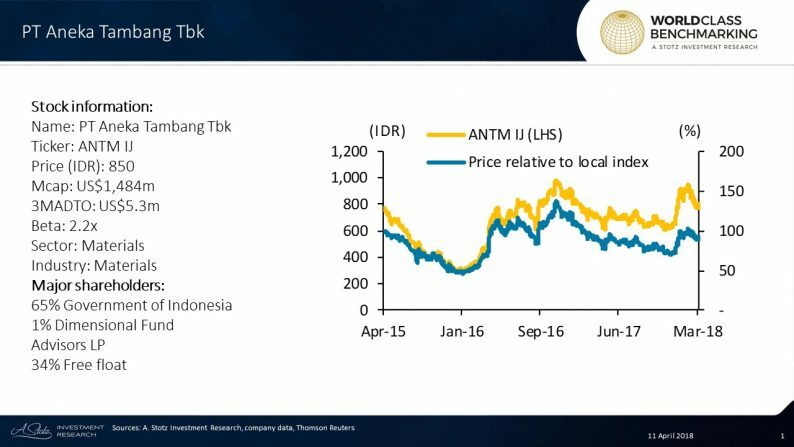 PT Aneka Tambang Tbk is a 65%-state-owned Indonesian enterprise engaged primarily in mining, refining, and processing of metals including nickel ore, gold, silver, and bauxite. It also mines coal. It is the largest nickel producer by capacity in the country, although precious metals account for nearly 2/3 of the group’s revenue. ANTM is a state-owned enterprise involved in the exploration, excavation, processing, and marketing of nickel ore, ferronickel, gold, silver, bauxite, and coal in Indonesia. 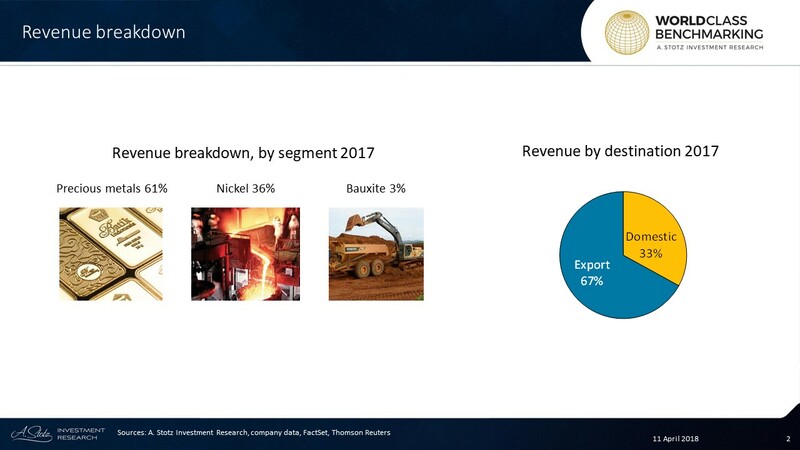 Its two major business segments, ferronickel and nickel ore, accounts for just over 1/3 of revenue, and gold, silver and precious metal refining accounts for just less than 2/3. Bauxite and coal are less than 3% of sales. Indonesia produces around 1/3 of the world’s nickel ore, but in January 2014 introduced a ban on raw nickel ore to encourage more value-added production in the country. This reduced world inventories of nickel ore, which only just started to recover in 2017 with the lifting of the ban. ANTM has been expanding downstream, as targeted by the government. Nickel is used mainly in the auto industry and for kitchen use. This year gold production should reach 2,201 Kg, up 11% YoY, ferronickel production should reach 26,000 tonnes, +19% YoY, while nickel ore should more than double to 11.3m wet tonnes. Fachrul Razi has served as the President Commissioner of ANTM since 2015. A large portion of his work experience has been with the Indonesian Military and the Ministry of Defence following his education from Military college. He also currently holds positions as President Commissioner of PT Central Proteina Prima Tbk (CPRO IJ) and Commissioner of the holding company of PT Toba Bara Sejahtera Tbk (TOBA IJ). He has completed degrees in Law and Socio-Politics from several universities.